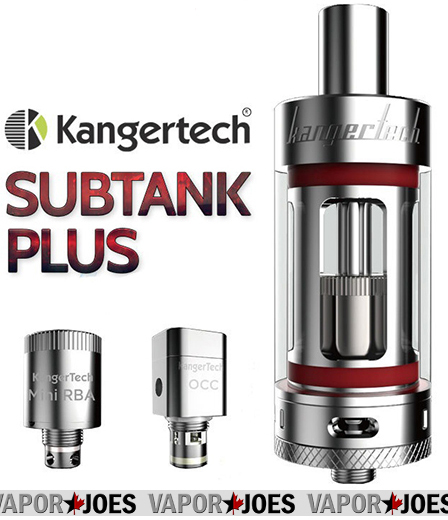 Introducing the Sub-Tank Plus, the newest generation of the highly acclaimed Sub-Tank series! The Sub-Tank Plus now can be filled with up to 7 ml of juice, as well as integrating new dual slotted adjustable airflow for an even wider range of airflow options! The 510 contact has been redesigned and now utilizes a set, non spring-loaded contact. Although tank capacity has been increased, overall dimensions remain the same, providing even better efficiency. The Sub-Tank Plus also has a redesigned chimney and RBA head, removing the need to switch the chimney and top when using either coil systems, and allowing for the RBA head system to utilize the same amount of tank capacity! A new drip tip is also included, shortening the overall profile while offering a cleaner, minimalist look. Experience the freedom to switch between Kanger’s newly designed Organic Cotton Coil Heads (OCC) and a new rebuildable atomizer head! Each OCC are made out of organic cotton producing better flavor and a cleaner taste. Easily switch from set coils by simply replacing your coil heads to the RDA head which you can build to your own desired level!